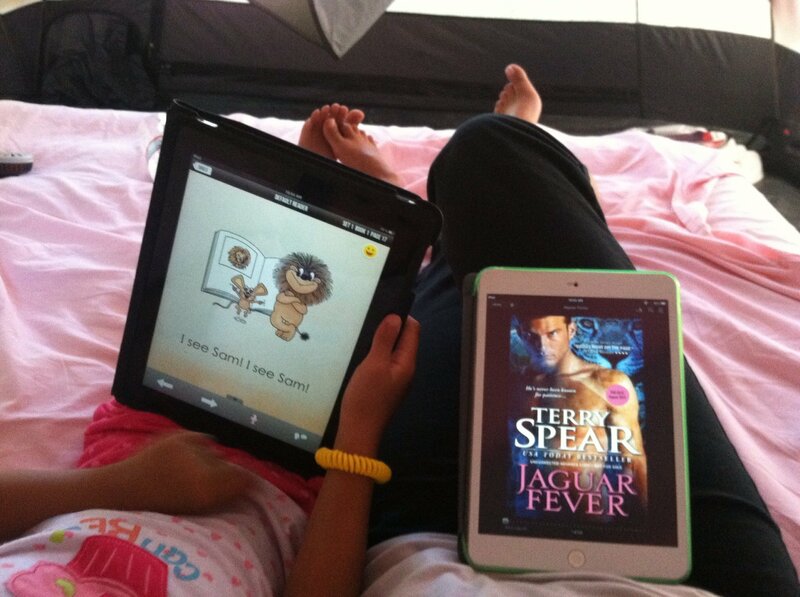 Under the Cover Blog Reviewer tagged me in the CUTEST ever photo of her daughter and her on a camping trip… reading in a tent. She gave me permission to share this on my blog. When I was growing up, my parents weren’t much to read. My mother loved books, but she never read them when I was home. My dad didn’t either. But I devoured books. We’d go to garage sales and I’d pick out all the books my mother could afford. I went to the school library all the time and read. When I went camping with my best girlfriend, Diane Stokes, her parents were big readers. Her older sister was a librarian. We all read at a lake visit one time, Diane and my sister and I also spent a lot of time in the snapping turtle-infested Central Florida lake. And we loved it! That was part of the adventure. Staying on the rafts and hoping that there weren’t any water moccasins or alligators also in the lake. And that the turtles didn’t bite us. Since my mother tangled with a snapping turtle in another lake, we knew they could actually remove a toe with their beak-like mouths–according to a ranger who treated my mother’s bite. So we splashed a lot to keep them away, hoping they didn’t think we were flopping fish and ready to eat! Both my son and daughter love to read as much as I do. And so do both of their spouses. So when I go on vacation? I take a book or three with me. I have friends who sit on the beach reading. Not me. I’m walking or swimming. But at night… it’s time to cozy up with a book and drift off to another world. What about you? Did you read as a family? Or are you the odd one out? I’m a big reader and probably get through a book a day. I’m the only one in my family that does any reading. hubby is dyslexic, so reading is a struggle, one son struggles with reading and the other prefers his computer. J Perham, I can understand your husband’s situation. My dad was a slow reader, but while he was a POW of the Germans for 16 months at the age of 16, the American Red Cross sent works of literature. And he read everything. When he returned home, he earned his GED after testing out on all the books he’d read during his captivity! My daughters (all 4 of them…18, 13, 11, and 3 years old) and I all share a passion for reading. To the point that my husband who was never a reader until he met me has become one as well (He doesn’t devour books like my daughters and I do but he still attempts it and he has discovered that “there is interesting things to read”.). I ALWAYS either have a library paperback book or my kindle fire with me!! I found Ms. Terry thru my library first. I’ve been reading for as far back as I can remember. We are a 3 generation readers, my parents, my self, my daughter! Thanks for the giveaway! Leann, I get so annoyed with myself if I’m stuck somewhere and have nothing to read. I’m going to put a couple of books out in the car so I don’t have that problem any longer. I always have a notepad out in the car just in case! I’ve written on napkins before when I’ve had a great scene in mind for a book. 🙂 I was in the airport with my Nook, but the charge had run out. So having a couple of paperbacks at hand should do the trick. 🙂 Super on being from a family of readers! 🙂 I read a lot of my daughter’s YA books too, and fell in love with them. I only started reading regularly about 20 years ago, when all the kids went to school. Started out with Suspense/Crime, which I still love, but 5 years ago I was introduced to PNR and I haven’t stopped reading since! I have a print library of 5000 books and when my DH always says “Did you see such and such on TV?” My reply is always the same “You know I don’t watch TV?” He replies “Yeah, Yeah I know, you read”. I tell him that’s why I won’t be getting Alzheimer’s, I keep my mind stimulated!! I love you books Terry, and pre-order every one! I got my love of reading from my grandmother. She was a member of the Harlequin club where they auto ship you books. I started avidly reading when I was around 14 and mostly romances, thanks to her. I went through a period where I didn’t read, but picked it back up about 5 years ago and I haven’t stopped. I read maybe 2-3 books a week. I am the only reader in my family right now since my son can’t read yet. My parents were both voracious readers of very different genres, so I was exposed to all kinds of stories as a kid. My daughters are as crazy about reading as I am, and my autistic grandson enjoys being read to (although in the last few years he has learned to read, which is SUCH a thrill for us all). I often give a couple of the basic “board books” as baby shower presents, like to catch those readers early LOL. Ah, Jeni, that is too cute!!! I love it. I’d always heard that if you read to your kids and read while being with your kids, that will encourage reading. But it’s interesting to see that some didn’t need that “role modeling” to give us that incentive. I love it! My husband and I are both voracious readers. We always read to our kids and encouraged them to read on their own as they grew older. Uh, Izzy, I did too! And I’m supposed to be writing the ending of A Hero of a Highland Wolf, when you have a son who is a hero in the flesh. Just totally touching. Grabbing tissue. Dabbing eyes. Thanks so much for sharing. My favorite to read to the kids was “Goodnight, Moon.” Though we loved “Go, Dog. Go!” also. When my kids were older and perfectly capable of reading on their own, I read all three of the unabridged “Wizard of Oz” books to them. It was wonderful. We all curled up on the couch together for the many days it took to read them and took the journey together. I’m definitely the odd one out in my family. My mom likes to read but it’s not something she makes time for. My dad isn’t a reader, and my brother never became one, but I always had my nose stuck in a book as a kid. I did go through a dry spell through high school and college, but now I average a couple books a week and have a TBR list that grows faster than I can get through it. My husband reads on occasion, but only when he’s in the right mood for it… if he’s not, even his favorite books won’t hold his attention. No kids yet, but I definitely plan to instill reading early and hope that it sticks as they grow. That’s wonderful that you read despite a non-reading family, Charleen. Every Christmas, besides a wish list of computer games, my daughter and her husband and my son and his wife ask for books. I always got them books growing up too. Or a series that they loved to read. Birthdays too. I think many have “dry spells,” while they’re busy with other commitments, but it sure is a wonderful way to relax and visit another world. 🙂 And when you have kids, they’ll love you for it. When I was a kid, my father, brother and I often read together when we were on vacation. We all read at other times, just not together. My husband and I are both readers, but we generally only read together at bedtime. My kids (now grown), unfortunately, didn’t pick up our reading habit. Ahh, Janie, maybe someday they’ll learn the joy of reading. Even with the ereaders, I think a lot more people are reading than ever before. Too cool about your family reading together! Love it! I love reading give me a few minute break in a line I’ll read. I have both kindle and nook apps on my phone. Love reading your books. My daughter is also a big reader. Take care. Happy writers make happy readers thankful I’m one. My mom was a huge readers and she read to us kids when we were little. I remember thunderstorms when we lost power and she gathered us around and read by the light of a candle to keep us calm and distracted. I didn’t pass on that love of reading to my daughter–or I didn’t think I did until I gave her a nook. She loved the Harry Potter, Twilight, YA series, and I can ‘share’ a book from my nook to hers via ‘lend me’ if I think she’ll like it. She’s so busy she can’t often finish in two weeks, but she’ll buy the ones she likes. My husband also loves to read, but his genre is horror. He has his Stephen King novels on his Kindle. But, there’s something for everyone and thank goodness for that! Adorable picture. Nice blog. I grew up in a family of readers but my sister and I read the most. In my own family, it’s more of a girl thing, the guys just want to do-not read about it. My son only became interested in reading when Harry Potter came out which just goes to show if you’re an author, keep on pushing that book even if it’s not “marketable” now. Can you imagine how many times J.K. heard that? 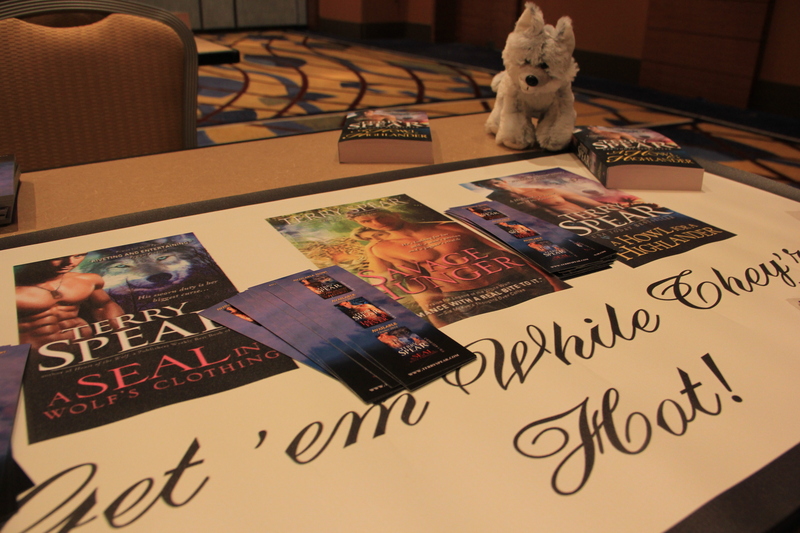 Hah – we wouldn’t be enjoying stories about camping werewolves now! When our kids were little we read aloud every day. We started with things like Winnie The Pooh (oh yes, it was a terrific book before Disney got hold of it!) and graduated to Anne of Green Gables and Where the Red Fern Grows. With each book, we added to our family’s secret lexicon. To this day if one of my girls says something leaves “so little scope for imagination” I know exactly what she means! Like yourself, my parents were both readers and my father drummed into my head – “The day I stop learning, please close the lid.” I never forgot that.